For 20 years, the Readers Choice Awards have given communities the opportunity to recognize their favorite local business. 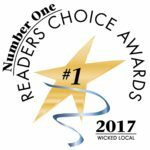 Wicked Local Favorites is a member of the award winning network of Wicked Local websites. In 2017, you voted us the #1 Chinese Restaurant in Framingham! We also received an honorable mention for best sushi restaurant! THANK YOU! Food is outstanding, both the Chinese menu and Sushi – freshest sushi around! And of course the Special Mai Tai’s – I wish they sold them by the bottle to go! The “secret house recipe”. Great atmosphere and nice employees led by their always smiling owner, Tina. Keep up the great work! Highly recommended. This place has the most delicious Mai Tai. The place is filled with regulars so the atmosphere is very sociable and interactive. They are professionals as well so they are very respective of each other. Their Pu-pu platter is delicious as well. My favorite Chinese food place ever!! The staff is always friendly, their special Mai tais are the best and really strong!! All of the appetizers are delicious and I always get the chicken in garlic sauce with rice too. Crab Rangoons are best I’ve ever had!